APSC Notification is out. 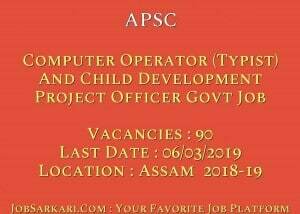 APSC is recruiting for 90 Computer Operator (Typist) And Child Development Project Officer Govt Job Posts. You can check APSC - Assam Public Service Commission last date, download APSC notification, visit APSC official website and check other APSC Vacancy details.Complete Vacancy and recruitment Details about 90 Computer Operator (Typist) And Child Development Project Officer Govt Job vacancies in APSC are provided below by JobSarkari.Com only for you. Last Date of Receipt Application Form. 06/03/2019. PH/ Candidate Having BPL Certificate. No Fee. Mode of Payment. Candidate Need to Pay Application Fee Through Treasury Challan in the Head of Account NON TAX REVENUE, OTHER NON TAX REVENUE 0051 PSC, 105 STATE PSC APPLICATION FEE RECEIPT OF APSC. Computer Operator(Typist) Candidate Must Have Passed Class 12th and Having Good Working Knowledge of Office Productivity Software Tools. Candidates Having a Minimum 06 Months Completed Diploma/Certificate in Computer Proficiency, From a Govt. Of Assam Recognized Institution and Must Have Computing Knowledge in Assamese and English Language. 17. Child Development Project Officer & Allied Cadres Candidate Must Have Passed Graduate in Arts, Science, Commerce. Candidate Must Have Passed Post Graduate Degree or Diploma in Social Works/ Labour & Social Welfare/ Sociology/ Anthropology/ Criminology. Candidate Should Have Passed Graduate in Child Development/ Home Science/ Nutrition or Graduate having Philosophy/ Education with Psychology, Economics. 73. Total No. of Post 90. For Computer Operator(Typist). 18 to 44 Years. For Child Development Project Officer. 21 to 38 Years. Age Relaxation. 3 Years For OBC/ MOBC And 5 Years For SC/ST. 3. Candidate Need to Fill All the Details in Application Form And Need to Attach Copy of All Mandatory Documents. 4. Candidate Have to Send the Application Form on Given Address On or Before 06th March 2019. Deputy Secretary Assam Public Service Commission Jawaharnagar, Khanapara, Guwahati-781022. Q. What is the Last Date For APSC Computer Operator (Typist) And Child Development Project Officer Govt Job Vacancy ? A. 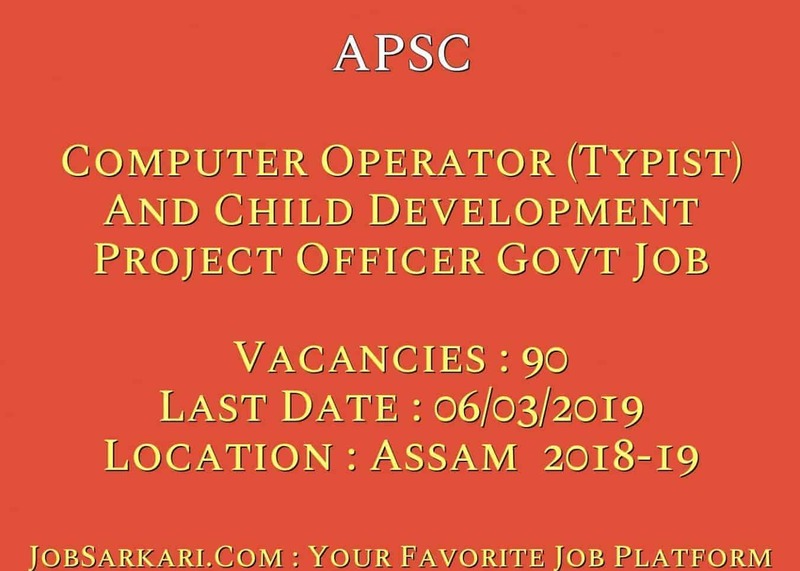 Last Date for APSC Computer Operator (Typist) And Child Development Project Officer Govt Job Posts is 06/03/2019. Q. What is the Form Type of APSC Computer Operator (Typist) And Child Development Project Officer Govt Job Recruitment ? A. The Form Type for APSC Computer Operator (Typist) And Child Development Project Officer Govt Job Posts is Offline. Q. How many vacancies are available in Assam Public Service Commission Computer Operator (Typist) And Child Development Project Officer Govt Job Posts ? A. There are about 90 Vacancies in Assam Public Service Commission Computer Operator (Typist) And Child Development Project Officer Govt Job Posts. Q. What is the Full Form of APSC ? A. Full Form of APSC is Assam Public Service Commission .